Around 1880 a group of Italian immigrants formed the Episcopal congregation of San Salvatore. Services were held In Grace Chapel until 1885 when philanthropist and social worker Catherine Wolfe purchased the historic 1830’s St. Philip’s Episcopal Church on Mulberry Street. The church had been used during the Draft Riots of 1863 as a shelter for the police. Wolfe, who “had become interested in work among the Italians,” according to The New York Times, paid $40,000 for the structure and spent another $5,000 in renovations. As more and more Italians arrived through Ellis Island and settled in the neighborhood around the church, its importance grew. Services were conducted in Italian and social work for the mostly poor congregants was conducted from the building. 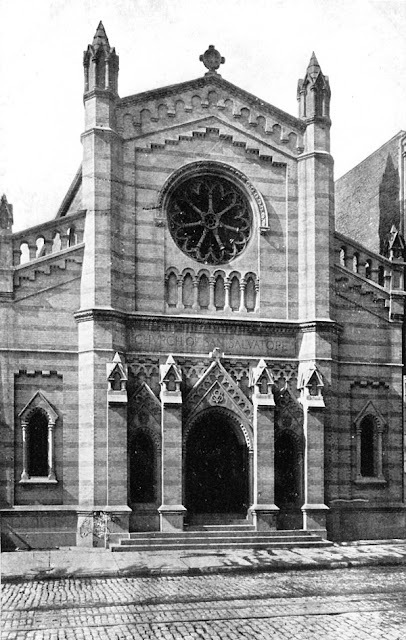 In 1897 came the news that the city intended to widen Elm Street, a plan that would necessitate the demolition of the Church of San Salvatore, which was by now a branch of the New York Protestant Episcopal City Mission Society. By May of 1901 the Brooke’s had been razed and plans were underway for the new church. A parish house was connected to the new church from which groups such as the San Salvatore Mutual Aid Society, Girls’ Friendly Society, Boys’ Surplice Choir, sewing and cooking classes, a Bible class and boys clubs were run. With time the Little Italy neighborhood changed. Chinatown spread into the streets once populated almost exclusively by Italian and Jewish families. San Salvatore eventually became home to Holy Trinity Ukrainian Church. Over the years the parish house was demolished, the two small stone Gothic towers were lost and the beautiful rose window is sadly damaged. Yet today, as it did at the turn of the century, the church building at No. 359 Broome Street continues to serve the special needs of a group of worshippers far from their homeland. The charming building is a pleasant surprise on an afternoon’s walk. My great grandparents were married here in April of 1908 by Reverand Abraham Cinotti (mentioned in the article above) Thanks for the background on this beautiful building. Reverand Abraham Cincotti was my mom's Grandpa ! Does anyone know if the church still has all the old baptism records? My great Grand Father Alberto Pace was very connected to this church. Can you expand on his presence and connection with the San Salvadore mission.